The Black Land and the Middle Kingdom will be the first extended comparative study of Ancient Egypt and Early Imperial China. While it has become common to compare Early China with Classical Greece or the Roman Empire, I argue that a comparison with Ancient Egypt is more appropriate and instructive, despite the great separation in time and space. This comparative study seeks to illuminate each civilization more clearly, revealing shared structural traits as well as distinctive features. The book employs a combination of textual, art historical, and archaeological analyses. It is divided into three sections, “Rulership,” “Administration,” and “Afterlife,” with seven chapters. The first chapter compares the management of the Yellow River and the Nile, exploring the intersection of environment, administration, and rulership, and critiquing the persistent theory of Karl Wittfogel concerning river management and “Oriental despotism.” The second is a comparison between two reformers, Akhenaten (“the heretic pharaoh”) and Wang Mang, whose short-lived dynasty terminated the Western Han. The comparison is employed to investigate the effectiveness of late-period reforms in mature empires. The third is a comparative study of imperial expansion and client states during the Han Dynasty and New Kingdom Egypt, investigating resource extraction, marriage diplomacy, and military force. The fourth looks at legal principles of China and Egypt as seen through excavated legal cases, focusing on adultery and robbery. The fifth shifts to the intersection of administration and the afterlife, with a comparison of the tombs of scribes in China and Egypt and the construction of scribal identity. The sixth (co-written with Marissa Stevens) will look at the use of architectural tomb models in both cultures and their role in funerary culture. The final chapter looks at paradisaical afterlife realms in China and Egypt and how one gained access to them. You can view a lecture based on some of this research here. I have been writing a book on the Qin Dynasty of China (221-207 BC), focusing on the First Emperor of China. The book will not be another biography of the First Emperor, nor a detailed history of the Qin Dynasty, the regime that established the political pattern for 2,000 years in China. Rather, the book will look historically at interpretations of the First Emperor in historiography, legends, literature, archaeology, and popular culture as a way to understand the interpreters as much as the subject of their interpretations. The First Emperor has remained a critical touchstone for Chinese politics and culture for centuries, criticized by those supporting Confucian values, lionized by those supporting revolution and nationalism, and romanticized by those fascinated with his terracotta warriors. You can view a public lecture based on a chapter from this book here. In 2015, I published a major book concerning early Chinese law. The book was co-written with Robin D.S. Yates of McGill University, a renowned expert on early Chinese legal and military history. The study of recently discovered texts and artifacts is a rapidly emerging field in early China studies. This book translates and studies a group of Chinese legal and administrative texts dating from the Qin and Han empires (late 3rd-early 2nd centuries BCE), recently excavated from a tomb at Zhangjiashan (Hubei Province). The tomb contained, among other types of materials, two important legal documents buried in ca. 186 BCE: a) the Ernian lüling (Statutes and Ordinances of the Second Year), consisting of a selection of 27 to 28 statutes and a set of ordinances on fords and passes; and b) the Zouyan shu (Book of Submitted Doubtful Cases). The importance of these texts for understanding the development of the early imperial legal and administrative system, social organization, and cultural values cannot be overemphasized. These extraordinarily detailed legal texts show how the Han rulers adopted and adapted Qin legal, bureaucratic, social, and economic precedents and how they and their Qin predecessors used the law to dominate and exploit local populations, including minorities, eventually forging a “Chinese” people. In some cases, there is also evidence of how ordinary people, including slaves, tried to use the law to resist the impositions of the expanding state. Making use of a full-text database we have created to facilitate analysis, and using epigraphic, Sinological, historical, and comparative legal methodologies, we offer a much fuller understanding of the history of early Chinese law. Our translation will be of value not only to historians of China and comparative historians, but also to those studying the importation of Western law into modern China, for, as it did in early imperial times, the law continues to play a transformative role in state-society relations, and is, in turn, interpreted and transformed by social and cultural practices in unexpected ways. The second volume of the book contains the annotated translation of the two major groups of legal texts from tomb no. 247. The longest, and in some ways the most important text, is the Ernian lüling (Statutes and Ordinances of the Second Year). It consists of digests of twenty-seven or twenty-seven Han statutes (lü ) and one ordinance (ling ). Some of the statutes are more complete than others, but it is clear that none of them represent all the items in the original text of the named statute, nor do the twenty-seven statutes represent anything like a complete legal code. The Ernian lüling apparently is a digest of legal material, made by or for the occupant of tomb no. 247, possibly used by him in the execution of his official duties, or specifically to accompany him into the afterlife. Listed below are the titles of the twenty-seven statutes and the one set of ordinances in the Ernian lüling, which gives some indication of their contents (with their section numbers in the published book). Many of these statute titles were known from received historical texts, but only brief descriptions or fragmentary paraphrases of their actual contents were known until this remarkable discovery. The second legal text from tomb no. 247 is called the Zouyan shu (Book of Submitted Doubtful Cases). It is basically a collection of case law, numbering twenty-two cases. The case records range in date from the 3rd century BCE to 196 BCE. With the exception of two of the early cases, the remainder of the cases had all been submitted by officials (mostly magistrates of counties or governors of commanderies) to their superiors for final decision, because something about the circumstances of the case made the proper judgment doubtful in some way. Some were appealed all the way up to the Commandant of the Court in the capital, the top legal official in the empire, who even consulted with the Emperor on at least two cases. The twenty-two case records in the Zouyan shu do not have proper titles and are only separated in the original slips by a black circle. We have summarized the content of each with a capsule title to give some indication of the nature of these fascinating cases. We provide a short introduction to each case, summarizing its contents and legal significance. Overall, the cases in the Zouyan shu reveal far more about judicial process in early imperial China than was ever known previously through received texts or from earlier archaeologically excavated texts. Taken together, the Ernian lüling and the Zouyan shu contain a wealth of information about law, state, and society in early imperial China. We learn much about how the bureaucracy and legal systems functioned during the Qin and Han and how law was used to establish and consolidate the imperial bureaucratic state in China. These texts also touch on matters of slavery, social class, merit and ranking, the status of women and children, property, inheritance, labor mobilization, resource extraction, market regulation, and contract law. Many of these issues are overlooked in received historical and philosophical texts but are of great concern to modern scholars. It is true that the Zhangjiashan statutes and ordinances are normative texts, and that they construct an idealized image of rational laws, an orderly society, and a well-functioning bureaucracy. But when read against the records of case law like the Zouyan shu and the Qin legal texts found at Shuihudi in 1975, and the administrative documents found in the well at Liye, Hunan in 1996, we can obtain a clearer picture of how these idealized laws were actually put into practice and how members of the official class and the rest of society negotiated their content and implementation. In 2018, the book was awarded an Honorable Mention for the Patrick Hanan Book Prize of the Association for Asian Studies. In 2007, I published my book Artisans in Early Imperial China (Seattle: University of Washington Press), which is a contextualized social history of artisans during the Qin and Han dynasties of China (221 BC-AD 220). I argue that one cannot truly appreciate the so-called art objects of Early China, without understanding something about the men and women who made them and under what social circumstances they worked. The book was well received, winning several major book prizes, including the Joseph Levenson Prize of the Association for Asian Studies, the Charles Rufus Morey Prize of the College Art Association, and the James Henry Breasted Prize of the American Historical Association. Early China is known to the general public primarily from the dazzling artifacts unearthed during archaeological excavations, like that at the tomb of the First Emperor of Qin. Terracotta figures and other artifacts of the Chinese past are often viewed without regard to the social context of their creation, yet they were made by real people who contributed greatly to early Chinese society and economy. Through this book, I hope to refocus our gaze from the glittering objects and monuments of China to the men and women who made them. Understanding these lives and the complex social, commercial, and technological networks they created will allow us to humanize the material remains of the past. This book represents the first, in-depth social history of artisans in Early China. Other modern studies have examined the material objects of Early China from explicitly technological or art-historical angles, producing admirable studies. None of these works, however, has ever seriously attempted to address the people who made this material and visual culture. How did these persons live? How were they trained? What health hazards did they face? Who were their patron gods? How did they market their products? How free were they? These are the questions this study attempts to answer for the first time. In Early China, an artisan was defined as a man or woman who made or decorated things with their hands. This label incorporated painters, sculptors, founders, masons, woodcarvers, and many other occupations. Ancient philosophers and social critics agreed that artisans constituted a vital class in society, yet these elite writers often pegged artisans below officials, scholars, and farmers on a perceived ladder of status. Because artisans worked with their hands, they were looked down upon by Chinese intellectuals and men in power who “toiled with their minds.” In addition, those critics concerned with the corrosive moral and economic effects of extravagance blamed artisans for producing worthless objects or wasting rare resources. Due to such biases among elite authors, artisans are rarely ever mentioned in received historical texts. They appear in the texts only in brief glimpses, often anonymously, and with no mention of their living or working conditions. Only by combining the historical approach with epigraphic and archaeological analysis could such a comprehensive account as this be written. Artisans in Early Imperial China is arranged contextually, with each chapter examining a different aspect in the lives and careers of artisans. Chapter One provides an introduction to the study, opening with two cases studies of famous objects (the terracotta warriors and the Changxin Palace lamp, and explaining how restoration of their creative context enlivens our knowledge of these famous artifacts. The chapter also critiques the sources available for studying ancient artisans and frames the two major arguments present in the book. Chapter Two analyzes the position of artisans within Early Chinese societies. This chapter seeks to answer a series of questions: What was the artisans’ social status and how were they viewed by others? What qualities made a particular artisan admired or despised? What social and occupational mobility did they have and what was their level of literacy? What role did artisans play in the economy? Chapter Three delves deeper into the practical life of artisans by stepping into their workshops. It describes how artisans were trained and what special tools and techniques they used to fashion objects. Then, it ventures into issues of working hours and workplace hazards or diseases. Important sections also address the unique religious practices of artisans and the role of women and families in the shops. Chapter Four follows the artisan into the marketplace and investigates how goods were advertised and sold. After a review of the structure of the Early Chinese economic geography, this chapter looks at the organization of official markets and the taxes and fees charged to artisans. This is followed by an examination of the startlingly modern marketing techniques used to hawk goods in a competitive environment. These include family trademarks, rhyming jingles, and knockoffs of royal products. Chapter Five elevates the reader from the dirt and din of the marketplace to the rarefied air of the court. The first part comprises a representative survey of the visual and material culture at court, examining the nature and purpose of a wide range of representational and decorative art. The second part looks at the lives of both professional craftsmen as well as amateur scholar-official artisans. Three men are singled out for examination. One is Ding Huan, an almost mythical craftsmen whose life story falls outside the traditional historical accounts. He is credited with inventing mechanical gadgets of great ingenuity and embellishing palace salons to an almost unimaginable opulence. Zhang Heng was a great poet and mathematician and the official court astronomer. He invented an ingenious seismograph and a mechanical model of the heavens. Cai Yong was a famous scholar and official at court, who also happened to be an accomplished painter and calligrapher. His role in the art produced for the court almost anticipates the great scholar-official artists of much later imperial times. Chapter Six ends the book on a sobering note, descending into the labor camps and slave markets to look at the most abject classes of artisans. These men and women are the conscripts, convicts, and slaves who built and decorated many of the great palaces, temples, and tombs of Early China. The chapter looks at their legal status, their living and dying conditions, and the tasks they were assigned. It argues that the state used a cold-blooded mathematical formula to optimally exploit each of these groups of coerced laborers without upsetting the balance of the economy or fostering revolt. Between 2002 and 2005 I worked with an interdisciplinary team of scholars studying the Wuzhai Shan cemetery site in Jiaxiang County, Shandong Province. The result of our investigations formed the basis of an exhibition called “Recarving China’s Past,” which was on view at the Princeton University Art Museum from March 5, 2005 through June 25, 2005. My contribution to this project was twofold. First, I drew on my research concerning artisans to write a chapter in the exhibition volume called “Carving Out a Living,” that looked at the stone carvers who make funerary monuments in Eastern Han China. I detailed the process of carving stone monuments and looked at issues of worker mobility, literacy, and level of compensation. I also introduced a section on techniques of efficiency and mass production in stone monument construction. 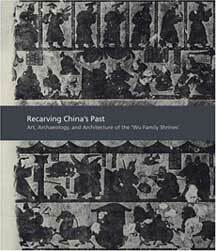 The exhibition catalog is called Recarving China’s Past and was published in May of 2005 by Yale University Press. To purchase a copy, click here. The second part of my contribution to this project involved making a comprehensive computer-assisted reconstruction of the site, as it may have originally appeared in the second century CE. For more information on the history and methodology of this project, and to experience the virtual-reality tour of the “Wu Family Shrines” cemetery site, click here. To watch the computer-generated movie that played in the gallery, click play on the controller below. (QuickTime 7.0 or higher required). This was the subject of my Ph.D. dissertation at Princeton. I had become intrigued by the problem of how non-mechanized workshops during the Han dynasty were able to produce millions of nearly identical objects. I concluded that they were able to accomplish this feat by using methods of production and management we more closely associate with the Industrial Revolution and with the modern world. From the earliest period of dynastic rule in China, specialized groups of artisans under official control supplied the ruling house with luxury articles and weapons of war. The Former Han (206 BC-AD 9) is the first period for which we have sufficient information to study the organization of these artisans and their workshops. Chapter 1 details the macro-organization of Han imperial workshops — the position of state-run workshops and factories within the political, economic, and geographic structure of the state. It follows a narrative structure which begins by describing workshops within the palace compound and expands outward to discuss larger factories in the capital and provinces. Factories were established according to the dictates of military strategy and following such practical guidelines as proximity to raw materials and labor resources. Overlapping production units provided goods of different quality to different markets and prevented reliance on one source for vital products. Chapters 2-5 narrow the scope of investigation by selecting a single imperial factory, the Western Workshop of Shu Commandery, in order to study its micro-organization. Micro-organization is defined as the inner workings of a workshop or factory, encompassing all stages of the production process and their management. Relying on a critically selected mixture of inscriptional and historical sources, as well as technical and stylistic analyses of the lacquer vessels produced at this factory, it is argued that the artisans’ labor was divided along very fine lines of specialization as part of a production process similar to the modern assembly-line method of mass production. Other mass-production tools such as turntables, pattern books, and standardized molds were used to produce thousands of nearly identical lacquer vessels on a short production schedule. As the factory organization became more refined, the quality of the artistic output declined. The factory management structure was modeled on the structure of the smallest unit of centrally-controlled regional administration, the xian “county.” Parallel to bureaus in the county government which managed various affairs such as law-enforcement and taxation, bureaus in the factory structure handled different media like bronze or lacquer. The dissertation will someday be revised for publication, but presently it is available for purchase from UMI Digital Dissertations. To buy a copy click here. During my dissertation research, I came across a group of lacquers that had been discovered more than a decade earlier in Anhui Province in the tomb of Zhu Ran, a general from the Three Kingdoms period. The lacquers had been published as outstanding examples of Three Kingdoms-period native-Chinese lacquer painting, but the unique style of the pieces left me dissatisfied with this explanation. A thorough stylistic analysis revealed that the lacquer designs were actually Chinese translations of Roman motifs found on silver plate. My article detailing this fascinating instance of cultural borrowing was published in Orientations magazine in May of 2001. Back issues of Orientations can be purchased by clicking here. As part of my MA thesis at Harvard in 1997, I began to investigate the intriguing case of the Chinese Bronze Age chariot. According to most accounts, the Chinese chariot appeared rather suddenly in the archaeological record around 1200 BC at the last Shang capital of Anyang, with no apparent indigenous prototypes. For years, scholars have argued that the Shang chariot must have been diffused from the West, either from the Near East, the Caucasus, or the Urals, and was introduced into a Chinese environment that knew nothing of wheeled conveyance. In my paper, I challenge this traditional view somewhat by pointing out that every other culture that had imported and adopted the chariot in the old world, had already enjoyed centuries of previous experience with wheeled vehicles, mostly four-wheeled wagons drawn by oxen or other draught animals. I then brought forth evidence that the Chinese had operated small utility carts on farms and in cities several centuries before the introduction of the chariot. I then reviewed stylistic, linguistic, and archaeological evidence for the diffusion of the Chinese chariot from the West, and conclude that the vehicle was indeed imported from Central Asia into the Chinese culture area around 1200 BC. It was taken up quickly, because of the Chinese experience with other wheeled transport, and adapted to Chinese needs on the battlefield and in ritual. As part of this project, I undertook a computer-assisted reconstruction of the Shang chariot discovered at Anyang, Guojiazhuang locus, designated as burial M52. This pit was discovered in 1987 and contained one chariot, two immolated horses, and two sacrificed humans. Though all of the wood had rotted in the ground, the soil where the rotted wood had been was a different color and texture than the surrounding hard-packed loess. Essentially, the chariot had cast a shadow in the ground, which could be teased out by slowly pealing away the soil until the transition in soil was reached. The excellent preservation state of this vehicle allowed the excavators to publish detailed measurements of the vehicle and its constituent parts. Most past reconstructions of Shang vehicles had been performed on paper, and failed to convey the structural complexity or impressive finish and appointment of these magnificent vehicles. A few experiments in Taiwan had been conducted in which modern wheelwrights recreated Shang vehicles for museum display. In my computer reconstruction, I began with the published measurements of the M52 chariot’s parts. I used these to create 3D models and fitted them together in the computer. Essentially, I was rebuilding the vehicle from scratch, and this gave me insights into methods and problems of vehicle construction. Finally, I covered the 3D models with textures of wood, lacquer, leather, and bronze to suggest the original appearance of the M52 chariot. This was really a dazzling vehicle, which seemed more suited to the parade ground than the battlefield. A revised version of this paper was published in Sino-Platonic Papers 99 (February 2000). A copy can be purchased by clicking here. View a short movie of this computer-reconstruction here. A similar project at the Royal Ontario Museum in Toronto, supervised by Barbara Stephen and animator Kathryn Saunders, used a computer to recreate a different type of Shang chariot. When I was a graduate student, one of the most challenging aspects of my education was making the leap from reading packaged classroom materials to reading actual journal articles in Chinese archaeology. It took me several weeks to read my first article, about three days to read my second article, and luckily things got faster after that! During that period of my study, I began compiling a database of those unfamiliar technical terms which arose in the articles. The list is categorized, and some entries contain illustrations or even Japanese pronunciations. The work is incomplete and probably contains some errors, but hopefully graduate students can find it of some use in accelerating their progress in reading these technical materials. Since this is pre-Unicode Chinese, some graphs did not translate into the PDF format from the original FileMaker database. Sorry!